Malaria has been one of the serious infectious diseases caused by Plasmodium falciparum (P. falciparum). Mitochondrial proteins of P. falciparum are regarded as effective drug targets against malaria. Thus, it is necessary to accurately identify mitochondrial proteins of malaria parasite. Many algorithms have been proposed for the prediction of mitochondrial proteins of malaria parasite and yielded the better results. However, the parameters used by these methods were primarily based on amino acid sequences. In this study, we added a novel parameter for predicting mitochondrial proteins of malaria parasite based on protein secondary structure. Firstly, we extracted three feature parameters, namely, three kinds of protein secondary structures compositions (3PSS), 20 amino acid compositions (20AAC) and 400 dipeptide compositions (400DC), and used the analysis of variance (ANOVA) to screen 400 dipeptides. Secondly, we adopted these features to predict mitochondrial proteins of malaria parasite by using support vector machine (SVM). Finally, we found that 1) adding the feature of protein secondary structure (3PSS) can indeed improve the prediction accuracy. 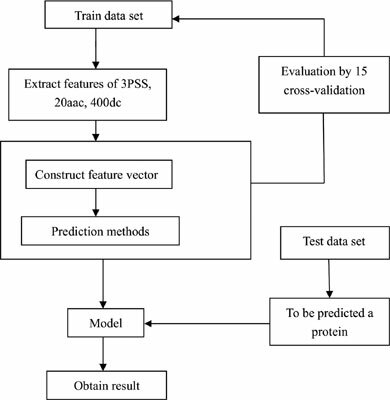 This result demonstrated that the parameter of protein secondary structure is a valid feature in the prediction of mitochondrial proteins of malaria parasite; 2) feature combination can improve the prediction’s results; feature selection can reduce the dimension and simplify the calculation. We achieved the sensitivity (Sn) of 98.16%, the specificity (Sp) of 97.64% and overall accuracy (Acc) of 97.88% with 0.957 of Mathew’s correlation coefficient (MCC) by using 3PSS+ 20AAC+ 34DC as a feature in 15-fold cross-validation. This result is compared with that of the similar work in the same dataset, showing the superiority of our work. Mitochondrial proteins of malaria parasite, protein secondary structure, amino acid composition, dipeptide composition, analysis of variance, support vector machine.